VIRGIL VAN DIJK admits he has had to “step up” after seeing Liverpool invest a record-breaking £75 million worth of faith in his ability. Having seen a switch to Anfield mooted for some time, the Netherlands international finally found his way to the exit at Southampton during the winter transfer window. A deal was agreed prior to January, with Jurgen Klopp having moved quickly and decisively to land a player many acknowledged was required to help plug defensive leaks at Liverpool. The Reds had to make Van Dijk the most expensive defender in history in order to bring the 26-year-old’s services on board, and he is fully aware of the pressure and expectation on him. “I am getting used to how we play,” Van Dijk told BBC Sport. 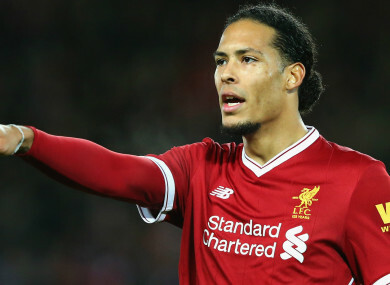 Van Dijk was pleased to see a protracted transfer saga brought to a close at the turn of the year, although he maintains that the uncertainty surrounding his future – first sparked when Liverpool were accused of making an illegal approach in the summer of 2017 – proved to be no distraction. He added: “People don’t know what really happened. “I kept my head down and kept playing. I was out for eight months and was just happy to play again. Once that call came, Van Dijk was never in any doubt that Anfield was the right place for him, with there a desire on his part to help bring the good times back to Liverpool. “I came here to achieve everything possible,” added the commanding centre-half. “I made the choice to come here base on everything. I love the fans, the atmosphere in the stadium and at away games. The quality we have in our team is unbelievable. I am proud and happy to be here. Email “Van Dijk: I had to 'step up' after £75m transfer to Liverpool”. Feedback on “Van Dijk: I had to 'step up' after £75m transfer to Liverpool”.